Birmingham City manager Gary Rowett says that teenager winger Viv Solomon-Otabor has all the potential to become 'another Demarai Gray'. The 19-year-old South Londoner, who was on Crystal Palace's books as a boy, is still to make his first Blues start. But he scored his first goal for the club in the 5-2 win at Fulham prior to the latest international break. 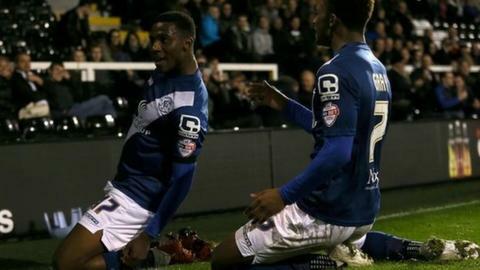 "If he can piece it all together, he's going to be another Demarai Gray," Rowett told BBC WM. "He's probably stronger than Demarai. He's quicker than Demarai. He doesn't take on players like Demarai, but he's got two really good feet. "He can smash a ball with both his left and his right, and he's a really humble lad, who works incredibly hard." Since Rowett's appointment a year ago, Gray has flourished, even becoming a £5m target for Premier League-bound Bournemouth in the January transfer window. Solomon-Otabor has so far had little more than an hour's first-team football in the seven late substitute appearances he has made for the promotion-chasing Championship club this season, but Rowett and his backroom team are slowly grooming him to make a similar impact. "This is why we've involved him so early," admits Rowett. "He's one of those players we have to take a bit of a hit with when he comes on the pitch. Sometimes he might be a bit erratic, sometimes he might not have so much composure. But he's quick. "He's got about six gears and this was only third gear. Having seen him in training, wait until you see him really open up. The boy can run." Birmingham's victory at Fulham, their best away win since a 6-0 success at Millwall in January 2012, left them sixth in the Championship over a third of the way through the season - just six points off top spot ahead of Saturday's home date with Charlton Athletic.